Around 1940, a young woman from the Washburn Farm in Hounsfield and a young man from the neighboring town of Adams were set up on a blind date by a mutual friend. They met in the driveway of a nearby store, situated on Mill Creek at the intersection of Old Salt Point Road and Parker Road, in an area known as Camp's Mills. Love blossomed, and on February 26, 1942 Beulah Ethel Washburn and Donald Thorp Jenkins were married. They purchased the old store property, and over the next few years they converted it into a home where they lived the remainder of their lives, running a television repair and sales service and other small businesses, while raising two children. The property they seemed fated to have was an historic one. Daniel Smith, from Columbia County, New York, located in Hounsfield about 1804 or 1805 on a creek that flowed to the outskirts of the nearby village of Sackets Harbor, situated on Lake Ontario. He erected a saw mill on its north bank (thus the name "Mill Creek") which he conducted for about 12 years, before selling it to Elisha Camp and removing to the Town of Rutland. 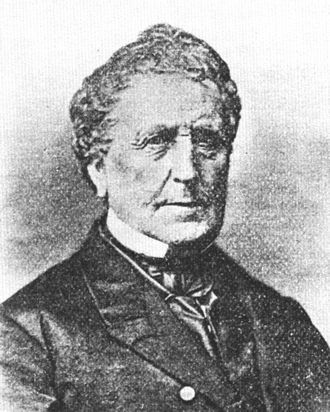 Elisha Camp, was brother-in-law to Augustus Sackett, a lawyer and founder of the village. Camp's family held vast tracts of land in the area during the early 1800’s, and was instrumental in the early political and military development of the region, particularly at Sackets Harbor. Elisha himself was Colonel of an artillery unit that defended the local settlements against a British-Canadian attack at the first Battle of Sackets Harbor on June 19th, 1812. Coincidentally, Beulah's great-great-grandfather, Asa Manley, participated in that engagement as a private under Col. Camp's command. Augustus Sackett signed as a witness present when Asa Manley collected his pay for services in 1812. Family tradition tells that the place was once "the center of town," and indeed it wasCamp's Ditch, an early water canal, ran through the property from 1832 to its demise around 1842, supplying power for the operation of the mills, including "E. Camp G.M." 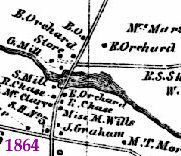 or "Elisha Camp's Grist Mill" visible on the 1855 land ownership map. A record in the county clerk's office shows that on 2 September 1859, Col. Elisha Camp and wife Sophia Hale of Sackets Harbor sold all of the real estate known as Camp's Mills, consisting of a saw mill, grist mill, stone house and about ten acres of land east of the road to Benjamin Orchard for $1,000. Benjamin, an English immigrant who located on a farm across the street from the property in 1832, continued operation of the mills, and he is probably the one who ordered built the store, which first appeared on the 1864 land owners map. In later years, a cotton mill and textile factory were established behind the store along the creekbed, and a rail line was laid next to it, the remains of which can be seen today. The store/house is one of the most ancient of its kind in the region. The structure was built of wood, with no insulation, atop a dirt-floor cellar made of bedrock from the nearby creek. There was no running water, due to salt and sulpher contamination in the ground (thus the name "Sulpher Springs"). In early days, water would have been taken from the creek, but in the last century, water has been trucked in weekly from the village and pumped into the cistern in the cellar. Hot water could only be had by drawing it from the cistern and boiling it on the stove. A working iron hand pump still stands at the northeast corner of the house. The house had no insulation or modern furnace. In the early or mid-1900's, a wood-driven "space heater" was installed in the dining room which warmed the downstairs and transmitted heat to the second story through large vents in the ceiling. 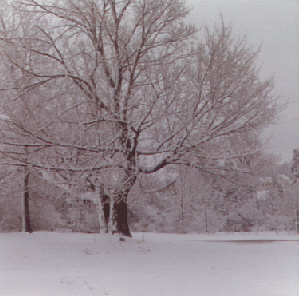 Even in the 1980's, it was common for residents to be greeted by frost on the interior of the windows during cold weather. Not all of the store was converted into a home. As late as 1985, the north wing of the house, which had been a sort of inventory room for the original store, was still as the last keepers had left it -- the earthen foundation could be seen through the worn seams of the wooden floorboards, the walls were stuffed with local newspapers telling stories from the 1870's and sporting advertisements of the latest industrial innovations, and the shelves were stacked with unused items ready for sale, like carpet sweepers, straight razors, and fishing gear. Outside, the ground was a cornucopia of historical artifacts. An original storage barn, standing until the 1990's, was littered two stories high with old machinery and farm implements. In the 1980's an automobile license plate commemorating the 1939 World's Fair was unearthed near the driveway, the rusted blade of a scythe was found buried nearby, and the old trash heap behind the kitchen harbored tin cans, apothocary jars, and beautiful cobalt blue medicine bottles. Beulah died in 1980, leaving Don a widower. In August 1984, to honor the place where her family had begun, their daughter, Ann, exchanged wedding vows for a second time in the front lawn near the "Old Maple." Don died just after Christmas the following year, at which time the property passed out of the family. 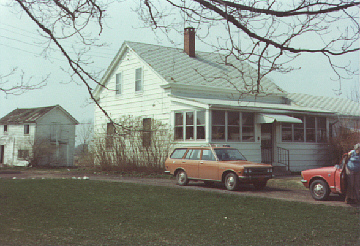 Today the home stands as a reminder of Hounsfield's once vital "center of town" -- still known as Camp's Mills. The "Old Maple" in the front lawn, escaped the logger's chain when the first settlements were made. 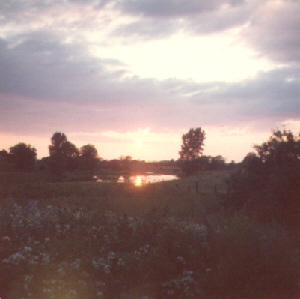 Sunset as viewed from the kitchen window, showing the former site of the old textile factory.